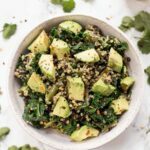 The best Lentil Quinoa Salad! Made with kale and green beans, then tossed in a vegan creamy cilantro-lime dressing. It's easy, healthy and just delicious! One of the things I love about living in New York is the food options. No matter what type of food you're in the mood for, there's bound to be a restaurant that serves it, probably in your neighborhood and probably open late. It's a great way to explore new cuisines, and luckily for those of us with food sensitivities, there are hundreds of places that cater to how we need to eat. And now that plant-based eating is starting to take off, the number of vegan or vegan-friendly restaurants popping up is amazing! It can be tough having a partner who eats differently than you and I'm rarely able to get him excited about eating at a vegan restaurant. When I want to try somewhere that's strictly vegan, I try to frame in a way that sounds mutually beneficial. Mainly that it's a great opportunity for both of us to expand our palette and try meals we wouldn't necessarily make at home. How does this relate to today's post? Well, the other I suggested that we hit up a popular vegan restaurant in our neighborhood, Candle Cafe, and to my surprise, he agreed! We started our meals with a pair of dirty martinis made with quinoa vodka. Then it was time for our apps: we decided to split the vegan nachos, which was a FAB idea. I rarely have nachos and it's making me realize I need to make some for you all! Then for dinner, I ordered the grilled kale salad. 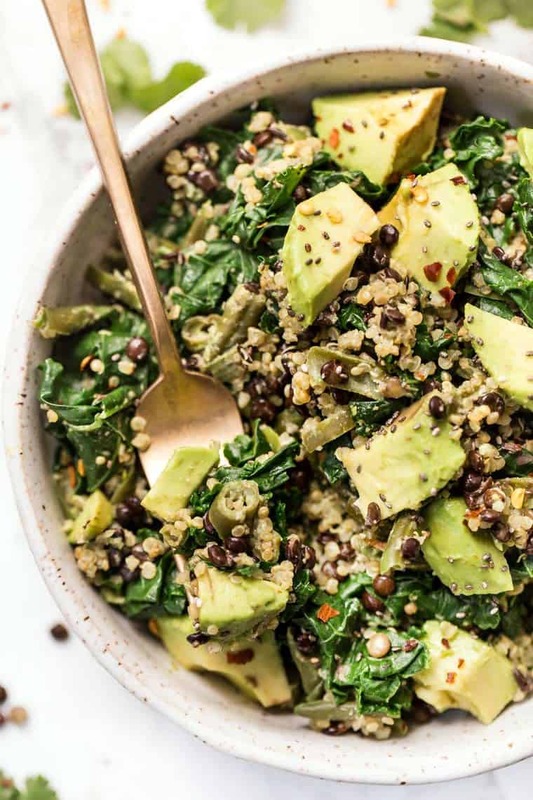 It was a huge portion of grilled kale, served with quinoa, lentils, green beans, and avocado. Then it was smothered in this incredible creamy dressing. 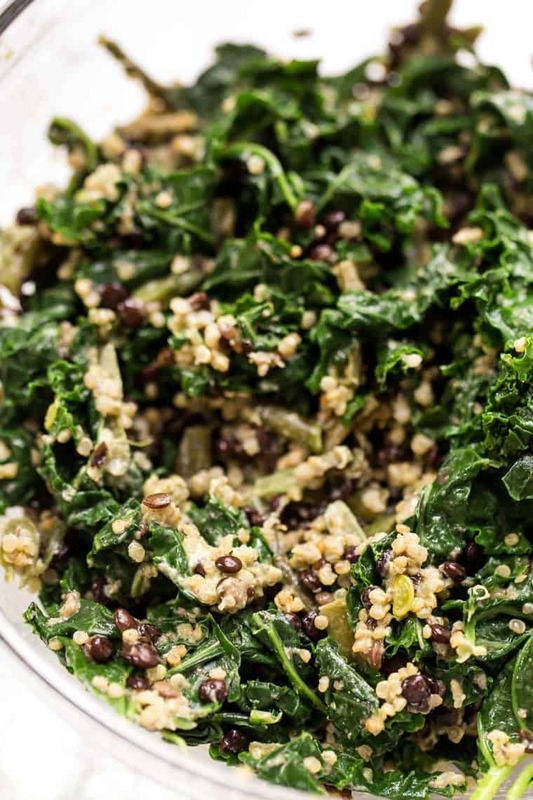 Seriously one of the most delicious kale salad I have ever had and I knew I wanted to recreate it for you. So that's precisely what we're doing. 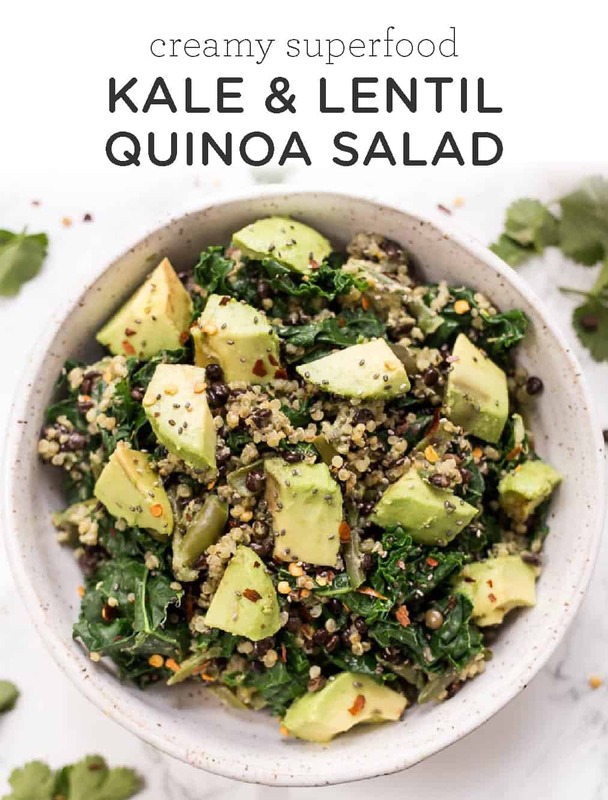 I know you're always looking for healthy, veggie-filled dishes and I gotta say, I think this lentil quinoa salad is going to become a staple in your rotation. Not only is it easy to make, but since everything is cooked, it's also easy to digest. While I love me a big kale caesar salad, sometimes all those raw leafy greens are just too much for my system. 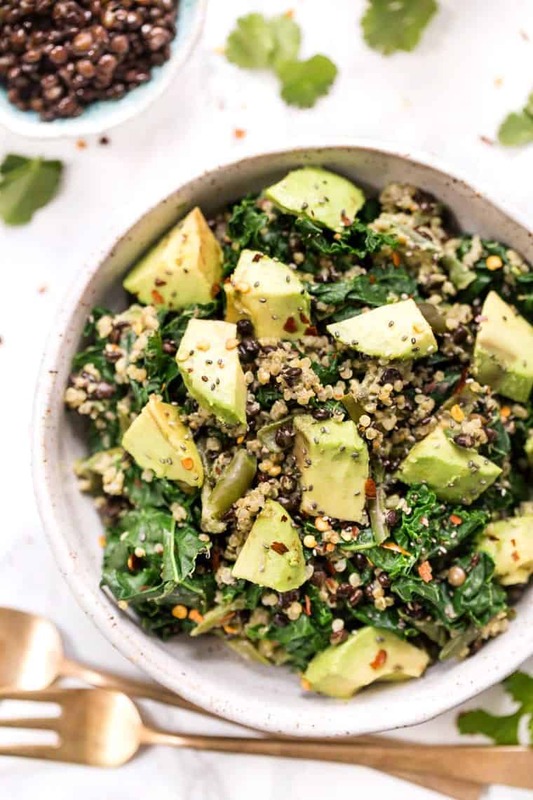 I end up feeling bloated and a bit gassy because I a) eat way too fast and don't chew enough and b) raw greens can be tough on your digestive system. So everything in this salad is lightly cooked (minus the dressing). It's fresh, it's flavorful, it's filling and it's totally satisfying. It's loaded with bold flavors, packed with protein, and couldn't be easier to make. I feel like I say this a lot with my creamy dressings, but this one is just SO good! We're using a base of non-dairy milk, then adding in a ton of cilantro, some garlic, a touch of lime juice and some tahini to round it all out. It's not only oil-free, but it's thick, creamy, vegan and totally delicious. I literally want to drizzle it on everything! And get this: it's so easy to make! All you need to do is toss everything into a blender, give it a whirl and you're done. Store it your fridge for safe keeping, use it as a dressing, or even enjoy it as a snack with your fave cut up veggies (it makes an awesome dip!). The very best part about this salad? It's dinner worthy, meaning it's a fill-you-up portion of vegetables that will leave you feeling satisfied, but not overly stuffed. It's loaded with flavor, it's got some amazing textures and it will certainly feed a crowd. You can make this as your main dish, bring as a work lunch or serve it as a side. Either way, it's going to get gobbled up in no time! 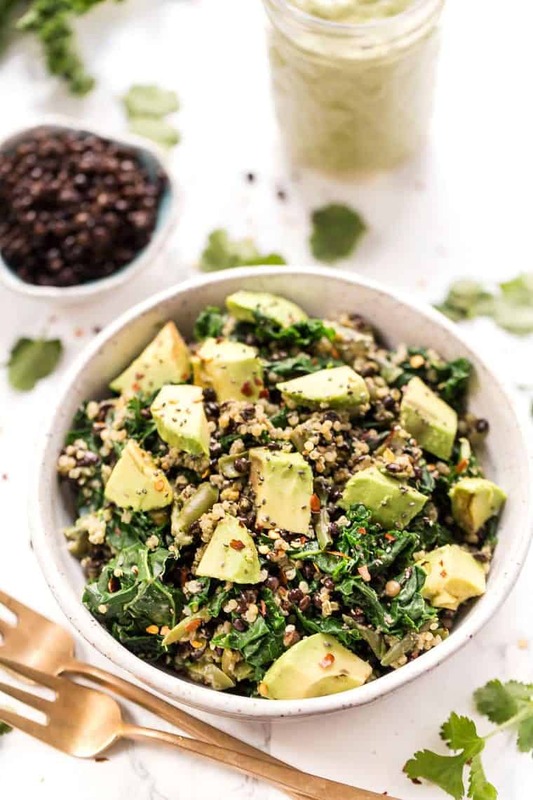 A healthy, simple and delicious kale quinoa salad made with a vegan creamy cilantro-lime dressing. And it couldn't be easier to make! Starting with the dressing, add all the ingredients to a blender and blend on high for 1 minute until smooth. Transfer dressing to a jar and set aside to thicken. Place a steamer basket in a large pot and fill with 1" of water. Tear kale leaves from the stalk and add to pot along with chopped green beans. Steam for 2 - 3 minutes until green beans are slightly tender and kale leaves are just starting to wilt. Transfer the veggies to a large mixing bowl and let cool for 10 minutes. Once cooled, add quinoa and beans to the bowl. Pour dressing over salad and toss until coated. Either serve immediately (and slightly warm) or place salad in the refrigerator to cool entirely. Upon serving, split evenly between four dishes and top with avocado pieces. * feel free to swap in frozen green beans for the fresh. just let them thaw and skip the steaming part. Congrats to you and Matt! I have been venturing into more vegetarian eating, and cannot wait to try this salad. 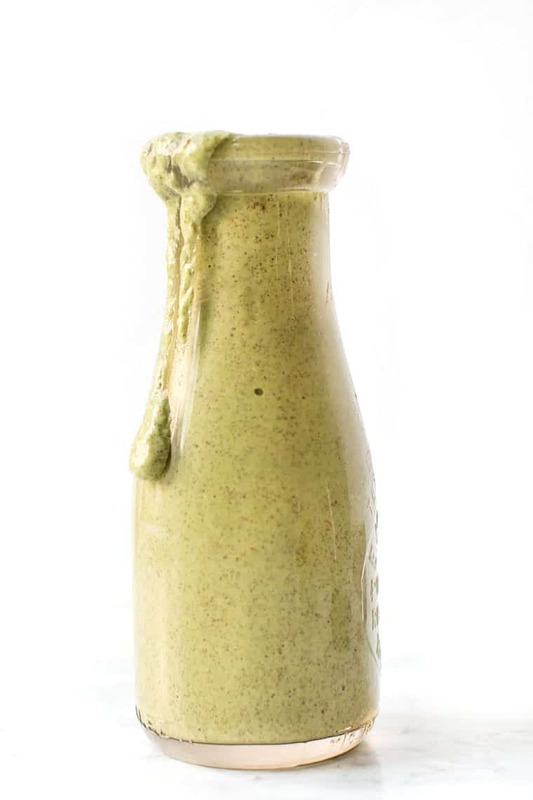 I love creamy dressings, but it’s so challenging to make a yummy dairy-free, creamy dressing. I also love anything with hot sauce and cilantro! I like the ingredients you used in this salad! So unique and never before seen almond milk used in dressing! Thanks for such a wonderful recipe! What kind of kale did you use for the salad? Of the different varieties, I’ve found some are more dry, some more chewy, some stronger in flavor, and others more mild. What do you recommend for a more sensitive palate? that’s the one reason I don’t care for Kale. It too chewy even when I cook it. Your recipe is awesome looking! Shame when I share to facebook it comes up with “Error 404” and a pic of a book, not the pic of the salad. That would boost sales if you could sort that “share button” stuff out I’m sure. Thanks for the feedback. I’ll surely look into it and see what I can uncover. Definitely don’t want that error page to be coming up! Terrific looking salad, Alyssa! I think the avocados and the creamy dressing are the perfect topping for this one. I wasn’t able to access the recipe from the link in the email. It went to a broken page that offered a free download of something of yours.